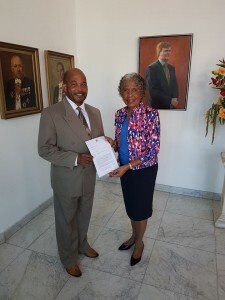 WILLEMSTAD – Kenneth Gijsbertha announced that he is the ‘informateur’ or the person who gathers information from all political parties to see the willingness to form a coalition. “As ‘informateur’ I will talk to all the political parties that have representation in the new parliament,” said Gijsbertha. Gijsbertha said that now he does not represent the party that he’s affiliated with, the MAN. He will also not involve himself and anything that has to do with party politics. He explained that indeed there is an agreement between four parties that have shown the willingness to form a coalition together. He also explained that this agreement is just to show their willingness, but that does not mean that they will form a government. It does not mean that he as ‘informateur’ cannot talk to other political parties about a possible coalition. “I will talk to all the parties and I will present my final report to the Governor on October 25 just as she requested,” said Gijsbertha. The ‘informateur’ indicated that the Governor wants him to inform about a possible coalition that has the support of 14 Members of Parliament, which is a two-thirds majority.